Have you ever wanted to grab information from a website but found it time-consuming to copy-paste everything? Well, here’s your way around that! Let’s suppose I’d like to get regular updates on news concerning Augusta, the state capital of Maine. Unfortunately, the Morning Sentinel doesn’t provide an RSS feed (that I can see) for just one town. 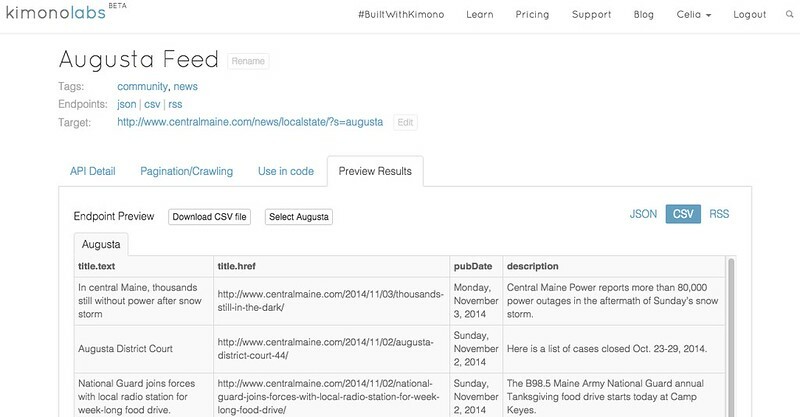 I can narrow it down to get 100 articles about all of Central Maine each day… but who has time to read that? 1. So, I can go to Kimono Labs and create an account, and glance at the tutorials to see how thing work. 2. Then, I install the extension on Chrome to allow me to easily select which parts of a website I want to extract. 4. 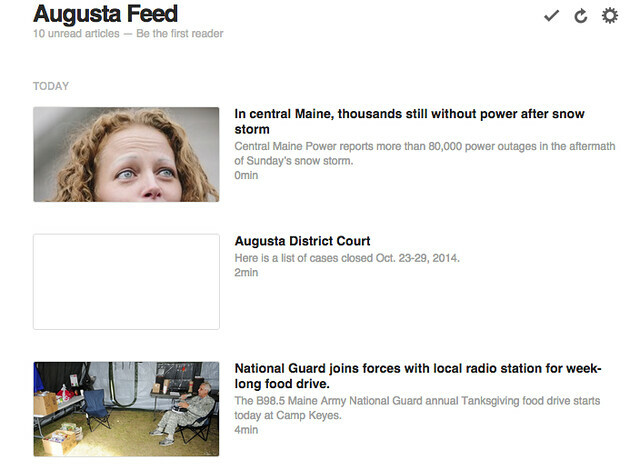 Go to the Central Maine website and search for Augusta in local news. I’ll let you follow the tutorials for this. Then, I label each aspect of the website selected (title, date, excerpt) so that an RSS reader can access it (see the Want RSS? button below? Yeah, click that). And there you go! 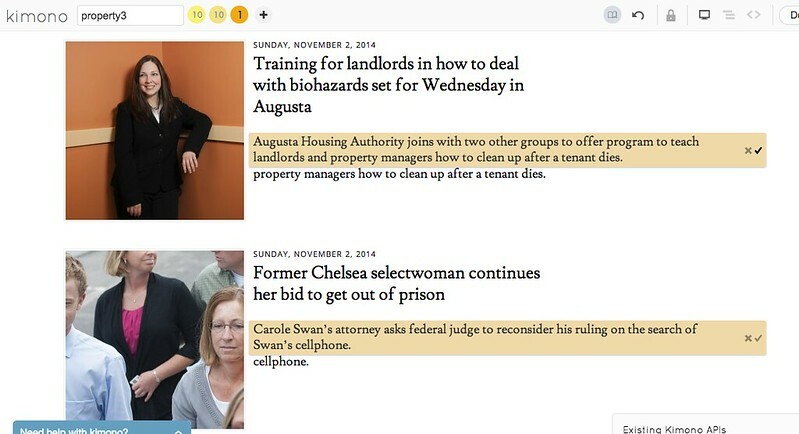 I’ve created a customized RSS feed for articles that mention Augusta (which, being the capital, is way too many articles; this would be more useful in a smaller town!). I’ve also seen that I can download information about articles and then analyze them in Excel. I have to admit I haven’t quite sorted out the details of RSS, as it seems to only pull the 10 most recent items at a time, but you can set how frequently it will update. A final note, of course, is that this is most easily justified for personal use, RSS feeds, or small student web projects. Do keep in mind the ethics of data extraction, especially if you’re planning commercial use, and check website terms to make sure you’re not extracting and analyzing data that isn’t permitted to you! In this case, I don’t find any notices telling me not to use info in this way, I’m using it for teaching purposes, and I’m not pulling anything subscription-based, just publicly available data–so I believe that I’m fine. More questions on Kimono? Find their help pages here!